We have previously reported that polysaccharides extracted from Pyracantha fortuneana (Maxim.) 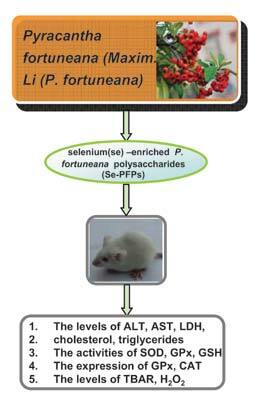 Li (P. fortuneana) lowered the oxidative stress and inhibited the inflammatory responses in mice. Our present study aims to determine the effects of Selenium enriched P. fortuneana polysaccharides (Se-PFPs) against carbon tetrachloride (CCl4)-induced liver injury in a mouse model. Our results displayed that CCl4 remarkably elevated the levels of alanine transferase (ALT), aspartate transaminase (AST), lactic dehydrogenase (LDH), cholesterol, triglycerides in serum. However, similar to BP treatment, supplementation of mice with Se-PFPs resulted in reversal of ALT, AST, LDH, cholesterol, triglycerides in serum. Contrary to CCl4, supplementation of mice with Se-PFPs elevated the activities of superoxide dismutase (SOD), glutathione peroxidase (GPx) and levels of glutathione (GSH) in liver. Furthermore, Se-PFPs treatment increased the expression of GPx and catalase (CAT) at mRNA and protein levels in liver which were decreased in CCl4 group. Contrary to CCl4, Se-PFPs supplement decreased the levels of thiobarbituric acid reactive substances (TBAR) and H2O2, which served as lipid peroxidation biomarker. Our study indicates that Se-PFPs administration is effective in attenuating CCl4-induced liver injury. The mechanism underlying this effect may be attributed to the reduction of oxidative stress and inflammation in the liver by Se-PFPs through up-regulation of the antioxidant system. Our study suggests that Se-PFPs might be a potential dietary agent in the prevention of hepatic damage. Selenium, Pyracantha fortuneana (Maxim.) Li polysaccharides, antioxidant, hepatic damage, oxidative stress. Department of Biochemistry, College of Medical Science, China Three Gorges University, Yichang, HuBei 443002, China.